Throughout the week I’ve documented my experience turning Apple’s $599 Mac mini into a complete media server—from upgrading the hardware, to setting up Front Row, to configuring the Mac to access local, networked, and Internet media; to controlling the works from a prone position. It’s now time to turn to The Big Picture. Is it worth the trouble? How family-friendly is the setup? And how does it compare to Apple’s media-centric option, the Apple TV? Netflix subscription: $9 a month. Excluding the Netflix subscription, taking the sale price on the external hard drive, and assuming that you already have all your AV components and an iPhone or iPod touch, that comes to $1,530. I was after a completely tricked-out Mac media center and that’s what I built. I could throw together something nearly as functional for not a lot more than the price of the mini, however. For example, the Mac mini’s 120GB internal hard drive is slow and it doesn’t hold a ton of media, but if much of my media is stored and accessed on network drives, who cares? I could do without both the Elgato EyeTV Hybrid and Turbo.H264 HD if I were willing to use my existing TV connection and TiVo and convert media more slowly. Toast Titanium is helpful for many things but Handbrake, though slow on this Mac, is a capable ripper and converter. (Handbrake can also replace RipIt). RadioShift is another luxury if I’m willing to listen to radio live via iTunes or a Web browser. And, if I can stand using half-a-dozen remotes instead of just one, I could do without the Harmony 880. Once I had the parts it took me the better part of a day to upgrade the mini and configure it as I’ve outlined. At the end of that day the mini functioned much as I’d planned. With iPhone in hand I was able to play music, videos, and podcasts; watch slideshows; access Hulu and Netflix; and purchase and rent iTunes content from the couch without much bother. With this setup I was confident that I could do without my DVD player, the receiver’s radio, and much of the content currently offered by my satellite TV provider. I have very little interest in televised sports so no loss to me on that front. But if you do follow sports, it’s unlikely you’ll want to toss out your cable box or satellite receiver. Live sports just isn’t served very well via the Internet. The same is true of premiere movie channels such as HBO and Showtime. You can purchase—or rent, via Netflix—shows from these networks, but they’re released sometimes a year or more after the season has concluded. To me, the quality of DVDs and audio from a Mac mini is no better or worse than what you get from typical AV components. If you’ve got a standalone DVD player with remarkable upscaling capabilities, one that plays multiple discs, or are concerned about region coding (you play lots of DVDs from other countries and don’t want a DVD player that locks after five region switches), you’ll want to stick with that DVD player. Otherwise, the mini plays DVDs just fine. The mini supports 5.1 surround sound with the correct digital audio cable, so you’re covered there too. Video is another matter. To begin with, there’s every likelihood that your mini will either over-fill the bounds of your HDTV’s screen (meaning the menu bar will be cut off at the top) or under-fill it if you turn off the Overscan option in the Displays system preference. I’m fine with the black border that appears around the Mac’s screen with Overscan off. You may not be. Streaming video doesn’t look as good as video coming from a cable TV box, satellite receiver, or OTA antenna. If your eyes explode when forced to watch video with obvious artifacts and occasional stutters, the Mac mini as media center may not appeal to you. On the other hand, that streaming content is free (or nearly so with a $9 a month Netflix subscription). And free is good, particularly when compared to a cable or satellite bill that runs nearly $100 a month. Video content from the iTunes Store, however, looks darned good. Personally, I’m more than happy with standard definition programming from the Store. Yes, the HD content looks better, but not so much better to my eyes that I’m willing to pay more for it or wait longer to receive it. One important test of the mini’s suitability as a media center is its family friendliness. My wife and daughter are renowned for their smarts and perseverance, but anyone's patience can be pushed to the limit when forced to deal with too much complexity. Would they have the patience to control it? The answer to that depends on what they wanted to do with it. With Front Row configured to launch at startup and some instruction on how Rowmote works, the family—already comfortable with the Apple TV’s interface—could navigate local and networked content with them. And considering that’s the avenue to the family’s music and movies, it’s a great start. When they had to venture outside Front Row to Netflix and Hulu via Boxee, however, they got lost. As I mentioned in an earlier installment, Boxee, Plex, and XBMC are powerful media applications, but their respective interfaces can be confusing. The family also balked at watching, recording, and playing back TV with the EyeTV hybrid. TiVo they get, as they’re in a walled-in interface. The EyeTV software, intuitive as I find it, has a computer-like interface and the vote was to stick with TiVo. The iPhone applications for controlling the Mac were another stumbling block. Air Mouse is certainly the most complete controller, but it’s not as good for simple Arrow, Return, and Escape presses as Rowmote and the Boxee application. And if all you want to do is deal with content in your iTunes library, Apple’s Remote makes more sense. But using these tools effectively requires knowing which is best for what and I could sense the frustration when I told my wife she’d be better off switching applications to perform particular tasks. Given these experiences I’ll suggest that a Mac mini media center isn’t something you should just spring on the family unless your family is wholly enamored of technology. Keep your current components, bring as much media as possible into iTunes so that it can be accessed via Front Row, and show your family how to use it. Getting content from Netflix, Hulu, or one of the other many sources available from Boxee, Plex, or XBMC is, in most cases, going to be the family geek’s job for awhile. What does a Mac mini configured as a media server have that an Apple TV doesn’t? The ability to reach out beyond Apple’s grasp. Easy-to-use as the Apple TV may be, it’s designed almost entirely as an adjunct to iTunes and the iTunes Store—bringing the contents of each to your television. Except in an era when so much content is available on the Web (and much of it not worth owning), that sentiment seems increasingly outdated. 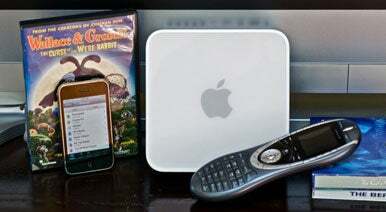 For those who find it so, the Mac mini media server is a flexible and capable alternative.